We can all recall catching ourselves in the vortex of emotions about certain whimsical CG characters who almost set us off in the beginning but ended up winning us over. 1) Dobby – Elves have always been known for nefariousness in the folklore with their amplified facial characteristics and shenanigans. Earlier, Elves evoked feelings of mistrust and wickedness that one would want to street clear of if we ever were pushed down the rabbit hole. 2) Buckbeak – A creature from the hippogriff family, Buckbeak was another classic character that evoked fear at first when Hagrid takes students to see him. Animals have a peculiar sense of judgement and instinct which allows them to judge as to who is worth being around. Just the way Toothless accepts Hiccup in that hair-raising scene, Buckbeak cottons up to Harry where Harry approaches the bird with a mix of fear and courage and finally gets a swashbuckling ride. The most amusing scene is when Buckbeak doesn’t proffer the same treatment to Malfoy and attacks him. Although the time travel allows them to rescue Buckbeak from being slaughtered, it hurt us to discover that Buckbeak was almost given the brutal death sentence for doing the right thing. Thanks, Hermione. 3) Drogon – Game of Thrones’ Dragon is no Barney. Dragon along with his two siblings is an extremely grotesque-looking dragon designed with ultimate intricacy. Each element about the CG-dragon looks immaculate and fear-inspiring in terms of appearance until one learns of the origins and the story. He is born along with his two siblings after Daenerys has their eggs placed on the funeral pyre erected for her deceased husband, Khal Drogo. As she gets up completely unwounded from the ashes of the pyre, we see the baby Drogon climb on her shoulder and lets out a daunting shrill marking the return of the dragons. One can see that even with all the ferocity, the mother of the dragons is able to tame the monster with impressive assertiveness that is only attributable to a mother. The way Drogon swoops in with his magnificent wings navigating through the skies and rescues the dragon-queen from the onslaught of the sudden uprising is praiseworthy. It’s poignant how the dragon takes many arrows, in a bid to just protect her. 4) Yoda – Another CG character that looks rather unsettling at first with the green hues and elf-like ears turns out to be the beacon of wisdom as the story unfolds. His adorable way of speaking English with the peculiar voice makes him one of the beloved characters of the fiction world. An ancient Jedi revered for his advanced age and wisdom, Yoda served as grand Master of the jedi order. His nuggets of wisdom have always been helpful to us. As he says, “Train yourself to let go of everything you fear to lose.” Train, we shall. 5) Gollum – The name itself is a derivation of the sound of his disgusting, choking cough. His revolting appearance constitutes his withered face and bald head with massive eyes and short-height as a result of his really old age. He had been deformed and twisted in both body and mind by the corruption of the ring. His chief desire was to possess the ring that had enslaved him. With the help of the technique of performance capture, Andy Serkis does a brilliant job of portraying the ambivalence in the character. 6) Fluffy – Who would have thought that Fluffy, the gigantic three-headed dog who was once cared for by Rubeus Hagrid had the weakness of falling asleep to the sound of music. Fluffy had been loaned to the headmaster, Albus Dumbledore for the task of guarding the Philosopher’s stone. 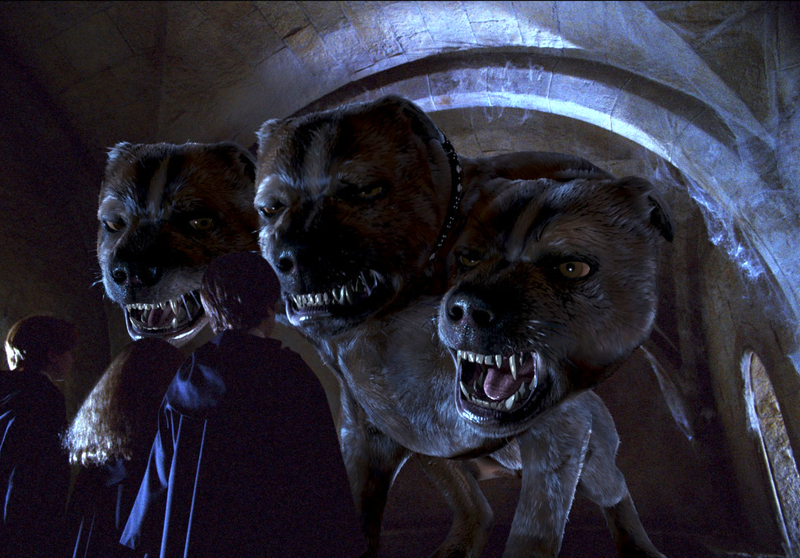 Generally quite horrific and fierce, Fluffy acted like a docile dog around certain people like Rubeus Hagrid. 7) Spark – When aliens land on Earth with an evil plan to conquer our planet, one of them turns out to be nice and caring as he gets bullied by the other three to a point that he is called a geek just like Tom. Spark helps Tom instead of antagonising him which makes for an affable spectacle. Multi-limbed alien Sparks is eager to please his new human friend Hannah (Ashley Boettcher). 8) Zouwu – Naturally, visual effects studios had to deliver some unusual creatures to live up to the title of the movie. Easily one of the most exotic and unusual elaborate so far is Zouwu, appearing in the recent Fantastic Beasts: The Crimes of the Grindelwald. The Zouwu is a giant furred beast with a lion-like mane and a magical tail. She fits the bill as she is both ferocious and playful. Framestore took on the challenge of crafting Zouwu with the impeccable touch of CGI. 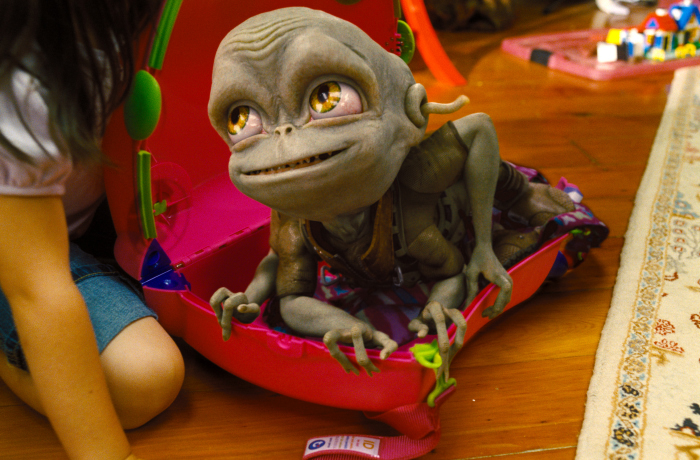 Occasionally, director David Yates wanted to make the Zouwu even bigger than was physically possible. 9) Beast – Originally a human prince, he was cursed by the witch as a punishment for his cruelty that only by loving another and earning their love in return can the Beast free himself and those affected by the spell before time runs out. With the absolutely ghastly appearance, it was sure as hell a heartwarming spectacle to discover that soft heart indeed lay underneath it all. 10) Thanos – Indeed, the biggest archvillan in the opprobrium of the Marvel fans (We risk offending fans by mentioning him) is Thanos. With such intricate CG, the giant purple man snaps his fingers and boom goes half the population in no particular order including some of our beloved Avengers. The question still remains. Is he really evil? Or is there a logos to the ultimate devastation he caused? Well, there could be. He does it for a greater cause (which we don’t agree with) rather than personal greed. There are scenes where we can see him shedding a tear. His ambivalence is indeed interesting to learn about. We hope you liked the list of CG characters that have found resonance amongst the masses despite all that ferocity. Afterall, It’s the beauty of the heart that counts. Beauty does lie in the eyes of the beholder. Especially those tennis ball-eyes of Dobby, Yoda, Spark and Gollum.